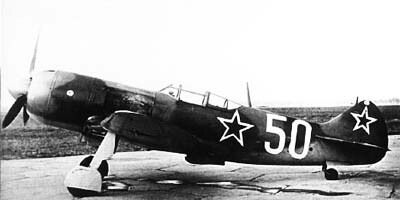 The Lavochkin La-5 was a huge success on the frontline and popular with the pilots. 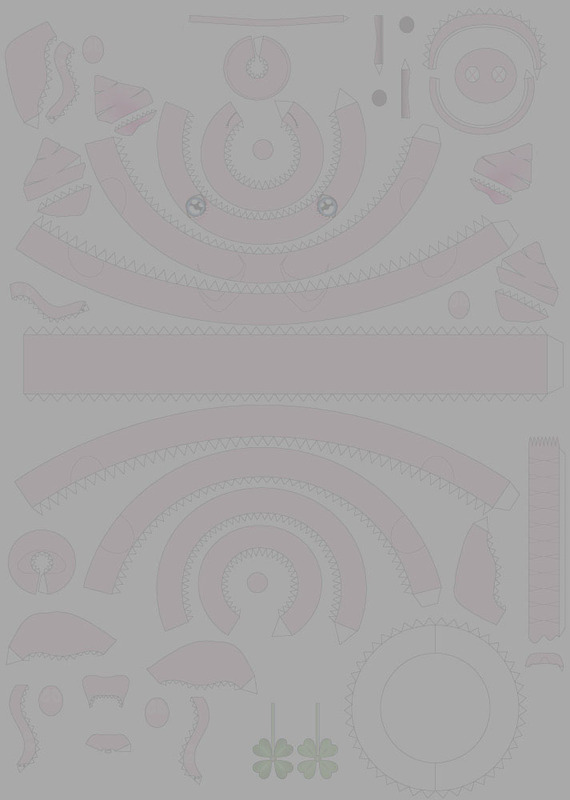 But its Designer Semyon Lavochkin felt that it could still be improved. Beside the ASh-82FN radial engine, there was no other higher developed radial engine available. But over time, the La-5 received weight reduction, when metal for more metal parts became available. 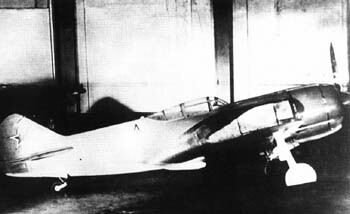 Apart from the weight reduction, Lavochkin’s design studio also made some aerodynamic improvements, which were implemented on the La-5 ‘205’, which was tested in the wind tunnel. February 2nd, 1944. The improvements included a repositioning of the supercharger intake from above the cowling to the wing roots of the leading edges, which improved the aerodynamics and the pilot’s view. Other visible changes included the repositioning of the oil cooler to behind the wing and an improved, slightly higher landing gear, which was completely enclosed to reduce drag. The La-7 also received different instrumentation in the cockpit, but like the La-5 it lacked an artificial horizon. 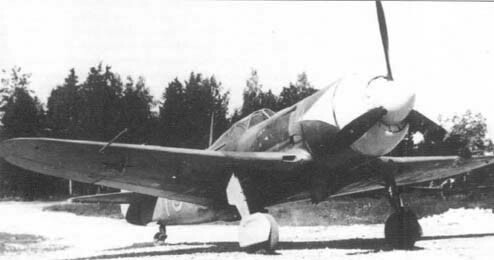 With the new top speed of 597km/h, the La-7 was not only a great improvement over the 546km/h of the La-5FN, but also outperformed the Focke Wulf Fw 190, its strongest opponent, whose top speed was 560km/h. An La-7 at the Scientific research Institute, in the standard grey-grey camouflage. The La-7's clean lines are evident in this picture. in September 1944. It proved very successful in aerial combat, and in the early phase of its service more were lost to engine failure than to enemy fire. Towards the end of the war, the number of La-7’s in service increased steadily. By January 1945 it were 398, and by May, when the War ended in Europe, it were 967 aircraft. The later versions were fitted with three newly developed automatic machine cannons instead of the two ones featured also in the La-5. the allies, downed a Messerschmidt 262 jet fighter in his La-7. It was used forpatrolling, escorting and air superiority missions as well as for strafing, bombing and reconnaisance missions. After the war the La-7stayed in service with the soviet forces until replaced by the La-9, which was a completely new development. In Czechoslovakia, the La-7 was flown after the war under the designation S-97 until 1960. In China and North Korea, the La-7 was flown until it proved inferior to a new generation of fighter jets in the Korea War. The La-7 became also known under the Nato reporting name “Fin”. 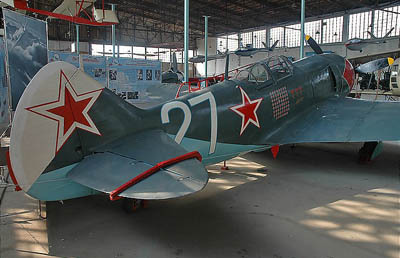 This La-7 preserved in a Museum in Moscow is painted in the livery of the La-7 of Ivan Kozhedub, the highest scoring allied ace of World War 2.